I am looking for folks with real world experience with fire steels. Over Christmas I got a gift card from Bass Pro and played hell spending it. I'm not in need of much so I wound up using it to buy an over priced light my fire ferro rod. This is a firesteel 2.0 army. I'm not sure I've ever had this brand. Folks rave about them. I have a dozen rods at least that I have used with great success. I really bought it so I could compare for myself. I took them out this evening just to throw sparks and I honestly couldn't tell much difference. I think a tender lighting test with different ones my be my project for the weekend. I guess I was expecting something amazing but it just wasn't. Not to say it doesn't work great I've just always been satisfied with what I've had so far. I bought a commercial model at a flea market. $3.00 as I recall. It has Kershaw's name on the handle of the rod and the stamped steel striker says "Light my Fire". The one I have is similar to yours but the striker doesn't have a handle and is made of a polished steel with little serrated grooves in it that you use on the rod. It doesn't seem to throw any more sparks than those I have made from ferro rods obtained on line but it does throw hotter sparks. I have tried a variety of strikers made from hacksaw blades and files, as well as just using the back of my knives. I thought it might be that the ferro rods obtained on line are not as good of quality as the one on the Kershaw model. By hotter I mean the sparks seem to last a bit longer and leave a smoke trail as they fall from the rod. No help here. I've always been happy with the cheap ones I get on ebay. I believe it was xj35 who turned me onto axeprice on ebay. I think I have given more away to kids & folks who have never seen the things before, than I use them myself. I am curious to what others would think also & going to wait & see what others have to say about them. I am glad ya asked here. UTC. Since, like ya said, there are some who swear by them & won't use anything else. I've never owned an LMF ferro rod, but I recall seeing a pretty thorough test on YouTube by some guy I thought gave pretty honest reviews on different pieces of bushLORE equipment. He tested the LMF rod against some of the el cheapo Chinese rods and he couldn't see much/any difference in them. I wouldn't know because I've only used the cheap ones. One striking/scraping surface that I've never heard mentioned anywhere before is the exposed backspring of a half-opened folding knife. I discovered it one day when I had a sheath knife in my bibs that had never had the spine squared off for use as a striker. The knife I ended up using was a bigger trapper pattern from Rough Rider that I had in my pocket at the time. It too, had never had the spine squared, but I noticed that the edge of the exposed backspring was just as square and sharp as a well sharpened ice skate. It actually worked better than the little piece of hacksaw blade that I had been using. You just have to be careful that you don't get cut from the exposed half-opened blade on the folder. Just something I remembered doing that I thought some of you guys might want to try with one of your folding knives. Well JB, I think you know i'm a F&S man too. It is a soothing fire making method for me and peace and quiet is usually what I'm looking for when I'm out. Like I said, the main reason I got this thing was to get the gift card off my desk. Honestly I looked over their website more than several times and just couldn't find anything that said "buy me". They have no axe selection either and very few knives. That put a bad taste in my mouth right off. An "outdoors store" that can't sale ya a decent axe. I am going to try and do a decent test this weekend if my time works out. Hell, the 2 in the photo above will probably last me a lifetime if I start twice as many fires as I figure I might. I guess I was figuring the thing would set the woods on fire when I scraped it. I think a lot of the magic may be in the scraper as well. Appreciate the replies. While some companies/brands may alter the percentages of materials slightly, I'm pretty sure they are all made in China. Most likely the same factory. Thanks for the credit imnukensc, I like a lot of the stuff axeprice sells. I have a 1/2 x 6 and another I cut in half. They are nice. I do have an LMF, but I think my exotac throws better hotter sparks. I got a 2 fer off massdrop some time ago. I have used the heck out of it and it's still going very strong. I think I'm going to pick up the XL model eventually. My experience has been mostly like everyone else, in past research I learned that there is a difference in ferro rods, the cheaper models are softer because if the metal content, they usually throw globs of molten magnesium but they wear out quicker than the harder more expensive models, the more expensive harder rods throw sparks that are hotter and dance around on hard surfaces. Which ones are better is anyone's guess, I've tried both and in my opinion I have better luck lighting tinder with the cheaper softer rods, and when you're talking a few dollars for the cheap ones compared to $15.00 bucks for a branded one, I'll take the cheap ones any day. Like most folks here I own a dozen or more ferro rods, I've been using them for five or so years and haven't worn one out yet, I did ruin one once by heating it up with a torch to get it off the plastic handle, from experience I can tell you truthfully, if you want to experience a rush, try it, but do it outside, and do it where it can't fall on anything hard because the explosion will be quite a surprise, and the burning slag will stand a good chance of messing up your pant legs, not to mention your legs. Again, like someone else mentioned, the type of sparks you get out of either types of ferro rods will depend more on the striker you use than the rod itself, I don't use the spine of my knives like the "Experts" do, I value my knives more than they do I guess, the tool I've found most handy for consistently throwing hot sparks is the sharpened edge of the awl on my SAK and on my US pocket knives. the ones from coghlan, and work the same. and brass lnadyard holes on all. I have bought more to set aside for emergency use, than actually use. I had one that I made a handle to match my knife... found it in a drawer all corroded. What's up with that? Hope you Have fun testing UTC. Ferro rods corrode when contacted by air, you'll notice that they all come with a black or grey coating that you have to scrape off in order to get to the composite metal under the coating that makes the sparks, once that coating is removed and the actual rod is exposed it will start to corrode and decay. Two things that can be done to slow the process down is to paint the exposed area after use or before prolonged storage, or make a cover or pouch for the exposed rod out of leather, a small length of rubber or vinyl tubing, or what ever else you can think of, even a piece of electrical tape will work. I am confused Moe. The Kershaw model Light my fire I have is over 5 years old, has almost no original finish on the rod, and has not corroded one bit. Neither has the one in my knife sheath, or the one I got from you with the BH knife. Does it have to be humid to corrode? I don't know if humidity is the problem or not, but I have had one in the hip pocket of my bibs for several years and it has never corroded in any way. In the summertime, I can't think of a more humid environment outside of Florida or Louisiana! Don't let it bother you Stan, I've got a couple of dozen or more of different makes and sizes, half of them are used the rest are attached to my knife sheaths unused and for emergencies only or sit on a shelf in my gear closet, the oldest one is about six years old, the only one that's corroded on me is the one I keep hanging on the peg board over my work bench, and the corrosion was very slight. I only know what I read, that they all corrode over time, I don't know why or how long it takes, and I don't know if cheaper rods corrode faster than more expensive rods, nor do I know just how much weather effects them, all I know is that mine will probably out last me in the long run, and if any of them don't, they aren't that expensive that I have to worry about replacing one. Interesting to read this after three months. None of my ferro rods have corroded regardless of where I left them. In the barn, in the truck, in the house. I didn't leave any outside but usually don't do that anyway. It may be humidity but it sure isn't anything out here in the arid West. I hardly ever use the dozen or so I have and none show any corrosion. I'm curious if the oils on our skin keeps them from corroding. I seem to have an instinct to run my finger down the length after use. I don't know why, to see if it's rough, or if there is a lot missing. I was a big fan of my exotac. Now that I've worked it down almost 1/2 it seems to have gotten harder and throws less gobs. It could be the striker wearing out to though. I think I'm going to get a few of the firesteel super strikers. I saw a youtube of joe robinet explaining why he quit alone. He lost his 1/2x6" ferro rod in black sand. What a putz. that and a knife were the two most important items and he loses one of them. Apparently making videos for youtube is easier than staying alive in the wet woods. LOL!!!! He had a fire made. should have made a fire carrier and kept an ember lit. Orbean, the magnesium bars with the ferro rod inserts on the sides WILL corrode.....I have one that did. Is that what you are referring to? no, it was a coghanlans ferro rod, it was left hanging outside of a fire pit on my grandfathers ranch. It had a white-ish color and after scraping it off it worked well. Welcome back, RBM. Long time no see! - Long wild field grass was the easiest natural material (for me) to initiate a fire with. Make a big wad of it, wrap it around in a big ball or nest, shove both hands in and scrape like Hades. -Damp materials will slowly dry out inside a big ball of natural material with repetitive machine gun like scrapping of the rod. Keep your hands and the rod inside the ball. It may take 10-15 minutes but the rod kicks off a surprising amount of heat inside the materials ball. I got damp chunks of wasp nest to catch this way. I almost gave up but I realized that going nuts on the rod was generating enough heat to warm my cold hands up a bit inside the large grass ball. -Have all your progressively larger fire creating materials ready before you start. -The scraper is VERY important. You need a very square spine of edged tool to scrap off the sparks with. I square my own knife spines off with axe files. I found little difference between a stainless or carbon Mora knife for sparks if both spines were extremely square. The carbon may have a tiny advantage, but not enough for my practical applications. I came across a key chain carryable tool called a ''Speedy Sharp'' which scraped off sparks magnificently. - Even the cheap Coughland (sp?) rods work well enough. I use them as practice beaters and keep my LMF as the primary unused back up. I sealed the LMF with liquid silicone then slid clear plastic fuel line over it. Sealed and unbroken on my key chain for years now. Or you can go to a dollar store and get some cheap nail polish and paint seal the rod, whatever. -I practiced in good weather with materials that I brought, then I practiced with natural local materials, then I practiced after rains. Believe me, it is not so easy sometimes, but it got easier with practice. - Now I feel that I have a certain level of practical experience and self confidence through actual use in various environments with various materials. But I am more interested in not dying in a bad winter situation so I also bring several lighters and fire enhancing materials. The more extreme the temp, the more I stack my side of the deck. I once met a guy paying for gas in northern Saskatchewan. He had a mag bar with the built in fero rod on it, the type used by the U.S. army etc. I believe. He was a pilot and told me that he believed that the mag bar saved his life fire wise after a northern plane crash. It caught my eye as it was in a custom made leather carry pouch on his hip. That was enough for me to learn about these things and begin taking them seriously when romping around outside.......I still pack lighters though. My key chain rod is a back up. I picked up this Lite my Fire Fire-Knife on Amazon over 4 years ago and I generally carry this knife with me. The fire steel (which snaps in to the pommel) is small so I don't use it often but it works fine. I was surprised to find that a stainless blade would make a good striker. I don't usually go for stainless blades or ones without full tang but this knife has been good to me so far. I do agree... the striker is key. I have some that scrape away too much material and others that barely produce a spark. I don't like some that come with Light my Fire rods because they are too aggressive at first then quickly lose their edge. Yeah, some of those 'strikers' can be pretty aggressive. If you look at them closely or with a magnifying glass you can see that there is actually a hooked edge on them that eventually breaks off and thus becomes gentler on the ferro rod, but less effective at producing big sparks. Whether you have a carbon or stainless steel 'striking, or scraping tool, I think a simple, but sharp 90* angle works best and longest. I'll try and remember that. I'm sure I have a few rusty & broken bits I've saved......wait 'til I tell Heather why I never throw anything away! You'll be her MacGyver hero when you light the bbq with a cordless drill, broken bit and a fire steel. Like Red Green always said, 'If the women don't find you handsome, they should at least find you handy'. Or, If you use 1/4" of striking area on a 4" drill bit that has 2 cutting edges it is a potential of 32 striking surfaces. I like having a drill bit to make holes for makeshift dowels on camp craft furniture. It is sometimes better than lashing depending on how much deadfall is laying around. If you put a wood handle on a 1/2" bit it might make a useful multi-tool at that. Would be easy to put a handle on a tap too. I love Red Green, dont get it here anymore. I find that a hatchet blade works great, or an old reciprocating saw blade which is what i carry. Fire steels I feel I can advise on, commercial flint ferocerium rods no, sorry, can't help. Ah, well. Where to begin?? Mischmetal (aka MM) is a misnomer. MM is a ferrocerium rod (aka ferro) without the iron or magnesium. Also the proportions tend to be different. MM is very soft. Much softer than any ferro any of us have used. That being said, there being a lack of terms that better describe the differences between hard and soft ferros, it sort of makes sense why people use those two terms. As long as we all are using the same definitions, don't see that it matters much which terms we apply. Speaking of terms, we strike flint the rock. We scrape a ferro. And yes, there are hard and soft ferros. When you've used both, especially side by side, you will understand. The differences are that hard ferros, beyond being harder, throw more sparks and less molten globs. The soft, of course, are the opposite: softer, more globs and less sparks. Further, the appreciable wear with each use of a soft is discernible. Whereas with a hard, barely any sign. Which is better? Kind of like a knife: the one you have with you or the one you use the most will seem best to you. If you are the sort who is picky about their tinders, processes them until very fine, mainly uses manmade tinders, etc than a hard ferro will suit you best. For those perpetually in a hurry, easily bored by processing tinders, find themselves using damp, wet, green or otherwise marginal tinders, prefers to be aggressive in their use of ferros and tinders, etc... Well, a soft will suit you best. When using a soft ferro long strokes and larger diameters work best. Therefore you will find it very worthwhile to get longer and larger ones. Especially when working with marginal, or marginally processed, tinders. The 1/2" x 5" for $7 USD shipped from axeprice or comelili on eBay are hard to beat. When using hard ferros with better tinders we can scrape only the last inch and reliably get flame in 1-3 scrapes. The Light My Fire Army 2.0 with the new scraper is excellent. Their newest scraper (as of 2015 when I last bought one) has a grey plastic handle with the dark rectangular metal to scrape with. The old stamped metal scrapers (without any handle, plastic or otherwise) were pretty much worthless. Scraped poorly and were easily bent. When using a hard ferro, I use a technique I invented several years ago: The Turn Key method. We hold the ferro in our off hand with our palm mostly up fingers curled around the hard ferro so only the last inch or so is showing. 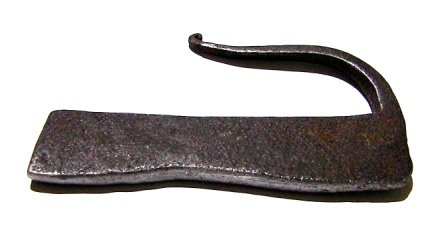 The scraper is held in our dominant hand and is turned in a manner most closely resembling a rapid turn of a key in a lock. Since our hands move less than 1/4" towards the tinder, the chance of disturbing it is minimal. With practice, sufficient sparks are generated to quickly light any of the better tinders. With a soft ferro I have produced flame from green wood with the sap still dripping in Springtime. Hard ferros can do everything a soft ferro can do. Hard are more expensive and throw more sparks, so it just makes more sense to use better tinders with them. Of course soft can ignite the better tinders just as easily. It makes more sense to use soft ferros with marginal tinders because they are cheaper and they throw more molten globs which produce more heat for longer. That was an EXCELLENT piece of information! Yes, the scraper (in both senses: you and the tool) matter most. Your experience, technique, the sharpness and hardness of the scraper, the tinder and how well it has been processed - each matter more than which ferro. Speaking of scrapers, I have successfully used oyster, green mussel and freshwater river clam shells. Glass, rocks, sandpaper, titanium and aluminum. SS and carbon steels. Even a can lid. The Corona carbide steel garden tool sharpeners work very well for scraping ferros. Too well sometimes as they tend to dig into the ferro. By the way, the Coronas also work as the "Flint" in F&S. They'll get chewed up even more than most rocks. But they will throw plenty of sparks with high carbon steel, pyrites and certain titaniums. I believe crashdrive123 is essentially correct. I have heard of one factory in China and one in Europe that manufacture ferrocerium rods. Not being in that industry, not sure that we are likely to hear of all that goes on though. I only have a couple of ferro rods and I know they are from China because that's where the source was on eBay. They are hard as a bull's horn and, although I've scraped them severely, show less wear than many I've seen. They spark very well, but you're right, I don't get those pea-sized fireballs rolling around in the tinder nest like I see on some of the videos. Since I used the flint & steel for decades, the sparks from my 'newfangled' ferro rods seem like a meteor shower by comparison. I still prefer the flint & steel for some reason. I've been using ferros since the early 1990s. (F&S since the late 1980s since we're strolling down memory lane.) I have soaked a ferro that had been scraped many times and a chunk of fatwood completely submerged in a bucket of fresh water for two weeks straight. There was some grey sludge from the ferro on the bottom of the bucket. However the ferro was not significantly smaller than when first put in. This sludge is very different from the corrosion we will discuss later on. Anyhow, after two weeks took them out, shook them off, and had flame in seconds. Can't ask for much more from a fire starter, hey?? What happens, as with all forms of electrolysis, is that in the presence of at least two electrodes, an electrolyte and moisture a current is generated oxidizing the ferro. In some circumstances this can result in a rapid destruction of the ferro. There is no way to reverse this. The only thing we can do is protect our ferros. In our case the electrodes can be the iron and cerium within the ferro, a ferro and some keys, etc. The electrolyte(s) can be salts, acids, etc from our skin, food, etc. Of course the moisture can be sweat, condensation, soy sauce, etc. As for protection... Ah well, that is easy. Any moisture barrier will work. Spray paint and nail polish are commonly used. Lard, vegetable oils, petroleum oils, petroleum jelly, Vick's Vapor Rub, Chapstick, resin, wax, mink oil, etc all work. As can storing our ferros wrapped in a ZipLoc, Saran Wrap, greased leather, waxed paper, inner tube, etc. A wrap or sheath is not needed as long as the ferro is kept dry. Which works best for you will depend on your environment and frequency of use. Same here as to preferring F&S. However I have long found that skills are perishable. So I do try to refresh each from time to time. Flicking a Bic feels awkward when it's been years since I've done so! Even though I have started almost all of my fires with F&S for many years, frequently carrying in only the striker and char, and have even been successful several times using only materials found along the way (nothing used for that fire had been brought with)... I still carry a Bic, ferro and fresnel all the time. I bought one of those magnesium bars with the ferro rod insert in one edge. It came on a beaded keychain with what looked like a small piece of hacksaw blade on the chain for shaving the magnesium and striking the spark. I tried it a couple of times to see how it worked. It did....so I put it in a small ziplock inside an Altoids tin, threw it in with my possibles and forgot about it. A few years pass, I find it again.....and what to my wondering eyes should appear, but a big, fuzzy, white lump of corrosion that was HALF the size of the original mag bar! How often do you play with the fres? With 4x it is not much fun, imo. Mine is a bit scuffed. My friend's kid has a 4" high X glass that might cook a can of beans if the tender is wet. I used to use magnifying lenses, including fresnels, quite a lot. Had quite a variety of sizes and magnifications at one time. Caught deals on some credit card sized fresnels in 3x and 5x so those tend to be what are in my kits now. The key with Solar Ignition is to think of magnifying lenses and reflectors as funnels. The larger the the physical size of the lens, the more photons (light) it gathers. The higher the magnification, the tighter the focus. Just as when funneling a liquid, larger funnels are faster and hold more while tighter funnels are slower yet more precise. So too with lenses and sunlight. Therefore what matters most is the size of the lens. Larger lenses will catch the most photons, and they are what does the work. A large, low power lens will produce an ember much more quickly than a small high power lens. Higher power does matter, and performs better, when the lenses are the of the same size. But only then. On the lowest end I have gotten embers with 1.5x reading glasses. Took a looooong time. The polished bottom of a soda can was faster. With the 3" x 5" fresnels at 3x and 5x, there is only a slight difference between them. Yet with about three times the surface area of the reading glasses, they were each much faster than those. To give some more examples, if your choice is a 1" diameter round lens at 20x vs a 3" x 5" fresnel at 5x, go with the latter. An 8-1/2 x 11 at 5x fresnel will outperform a 4" diameter 15x glass lens. Both will be fast, but the larger will be faster. Scuffed lenses lose efficiency quickly. Think of a funnel clogged with debris. Fresnels are made of very soft plastic, so they scuff easily. Glass lenses are harder so they resist scuffing better. Try to cover any lens with a soft cloth and a dust proof case for long term carry. For tinders we want good coal extenders (aka CEs). CEs are anything that will grow a coal. The less tending they need to do so, the better or more optimal we consider them. Some, such as primo white rot punkwoods, chaga, the trauma and pore tube layers of Hoof and Artists fungi, etc are fantastic. Merely start an ember in one end and they will burn down to nothing but a pile of fine white ash without any effort on our part. Others, such as most shelf fungi, red rot punkwoods, etc will work, but they need a lot of babysitting. Most CEs are in between. Color matters. Try using light colored punkwoods, plant fluffs/downs, cotton balls, white paper, etc. Then smear them with charcoal, a sharpie (black magic marker), etc. Darker is better. Even with pieces from the same object, when darkened we can see the difference in time to ignition. Solid is better. Loose crumbles, plant fluffs, grasses, etc can be tough to work with. If you can't get a large enough piece to work with, go the opposite way and crush it. Fine powders work almost as well as solids. It's the stuff with lots of edges and gaps that give us fits. Another tip is to pre-char an area before going for an ember. Just as with micro-charring NUTs with F&S, or filling the notch with Friction Fire, the tiny embers with Solar Fire have a tough time growing in the less optimal tinders. We can make the tinder better on the fly by charring an area with our lens. Usually a dime to nickel sized area suffices. It will depend on the tinder, lens and our skill. On bright summer days with large lenses and better tinders we can go straight to flame. There are vids out there of guys taking 2x4s straight to flame with large fresnels! However most of the time we will be going for an ember when working with Solar Ignition. We can make embers any time of year with Solar Ignition, but we do need strong sunlight. It needs to be more than half the value of full sunlight at noon to work well. So get your materials ready and seize the moment when the clouds pass! As with all of the primitive skills, they seem difficult at first. As we gain knowledge and skill we figure out the little things that make it work or not work. From then on it seems easy to accomplish our tasks. So stick with it!! One day you'll look back and realize that you are an old pro and flame with Solar Ignition is as easy as with matches for you. Reviving an old thread rather than starting a new topic. I have found these cool little HSS cutter bits at harbor freight. They are designed for cutting tools for a mini metal lathe. These are as good as carbide I think in getting sparks off a ferro rod. There are four corners and they can be cut down and handled for some excellent scrapers. I found them in our local store for $2.99. The ones in this link are more but they might be bigger for a larger lathe? My kit had a thin and wide peice as well as the square and one round. Epoxy the square one in a piece of deer antler and it would make a good striker for a ferro rod. We have a HF in a town about 60 miles away and next time I am there I will look for them.